A lot of New England Patriots fans may say they’d like to be Tom Brady. But it’s a good bet that hardly as many aspire to eat like him. Over the course of his NFL career, the 40-year-old quarterback has adopted a notoriously restricted and regimented diet, as part of his overall philosophy toward health and fitness. In Brady’s new book, The TB 12 Method, which goes on sale Tuesday, the Patriots quarterback outlines what an average day of eating and working out is like in his shoes, or cleats. Or Uggs. As he has done in the past, Brady advocates eating “real foods” and achieving balance — almost to an extreme. And while the outline indeed hawks a number of Brady’s pricey self-branded nutrition products, it also provides a first-person account of the eating habits that have fascinated and flummoxed his fans. On an average day, Brady says he wakes up around 6 a.m. and “immediately” drinks 20 ounces of water with electrolytes. 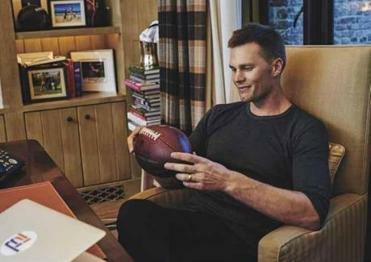 As he discusses at-length in the book, Brady stresses the importance of staying hydrated and says he drinks 12 to 25 glasses of water a day, always with his TB12 electrolyte concentrate added. Perhaps one of the most well-known items in Tom Brady’s highly restrictive diet is his avocado ice cream. “I add electrolytes to virtually everything I drink,” Brady writes, including lemonade. After his obligatory 20-ounce glass of water, Brady showers and goes downstairs to make some sort of smoothie. Once full of fruit and seeds, Brady says he works out roughly around 8 a.m., which is another thing about which he speaks at length — both in the book, as well as with any reporter who will listen (the key term to know is pliability; just ask Jon Gruden). During his workout, Brady says he makes sure to drink more water, along with more electrolytes. Once finished, Brady says he has a protein shake made of one scoop of his self-branded protein powder, almond milk, and — of course — more electrolytes. And always within 20 minutes. “Wait any longer and your body will begin seeking its own protein sources and start tearing down muscle you’ve just been building up,” he writes. Brady says he is committed to the “20-minute rule” and “rarely” does any intense workouts without a protein shake immediately after. Also, it’s only 10 a.m. at this point. The days must feel long when you’re Tom Brady. Around 11 a.m., Brady says he may have some snacks before lunch if he feels the urge. In fact, Brady encourages snacks. “I never go long without snacking,” he writes. It’s no coincidence then that he also sells $50 packs of his own TB12 snacks — which contain a lot of the same sort of foods that he puts in his aforementioned smoothies. As he outlines in the book, Brady follows four general principles about combining food. The first is not to eat proteins with carbohydrates like potatoes or bread. The second is that mixing proteins or carbs with vegetables is “ideal” for digestion. Except for nightshades, of course. “I make sure most of what I eat is alkalizing,” Brady writes. In addition to his strict regime of mostly plant-based foods, Brady follows a so-called alkaline diet, which purports to minimize muscle inflammation. Long story short, he generally tries to limit “acidifying” foods — such as white rice and bread, but also cold cuts, pineapples, and yogurt, to name a few — to 20 percent of his diet. The other 80 percent he says should be made up of alkalizing foods, like Brussels sprouts, sweet potatoes, and dandelion greens. From 2 to 5 p.m., if he’s feeling snacky again, Brady says he might have another protein shake, protein bar, or fruit, such as grapes, a banana, or an apple. Brady’s third principle of combining food is not to eat fruit with other food, which he says is bad for digestion. His fourth principle is not to drink much water with meals, for similar reasons. Otherwise, Brady says he drinks his electrolyte-infused water as much as he can throughout the day. Other snack candidates include chips and guacamole, hummus, raw vegetables, or yet another protein shake. “I’m never lacking for protein, and some days I’ll have up to three or four scoops of protein powder,” he writes. Dinner comes around 6 p.m. in the Brady household. “Dinner is another nutrient-dense meal that includes a lot of vegetables,” he writes, without getting into specifics. “I don’t really drink tea, but I might drink a cup of bone broth,” Brady says. He “rarely” drinks alcohol. Elsewhere in the book, Brady includes meal recipes for burgers made out of chicken or salmon, accompanied by various salads of avocados and greens. There’s even a recipe for — gasp — pasta with creamy sauce. “Personally, I don’t eat this often, for reasons I described earlier,” Brady says of the pasta, made of brown rice flour. “But again, it’s always about balance,” he adds. However, the book does include a recipe for Brady’s now-infamous avocado ice cream. Sometimes, he says, he’ll have another protein shake, if he’s working out hard the next morning, which on an average day, he probably is.